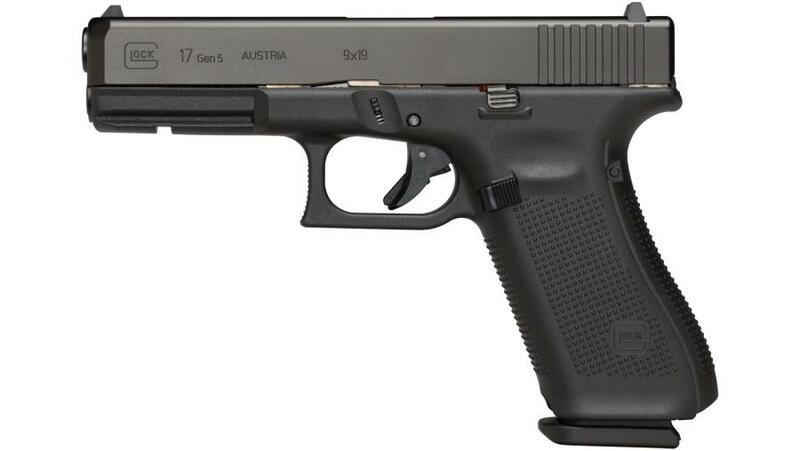 Glock 17 Gen5 9mm 4.5" 17rd | FIFTY1FIFTY TACTICAL, LLC. The G17 Gen5 features a no finger grooved, mutiple backstrapped, rough textured frame with hundreds of miniature spikes which results in remarkable traction for extreme enviroments and gloved operators. The frame also features a smooth trigger, reversible mag release, and ambidextrous slide stop. The magazine comes with a floor plate which is extended at the front for faster magazine change, and a orange follower, while the flared mag-well makes it easier to funnel the magazine into the mag-well. Glock's nDLC finish provides a tougher, more durable protection against corrosion and scratching. The Glock Marksman barrel features a barrel rifling which delivers improved accuracy. This Glock Gen 5 model has an AmeriGlo green with orange outline front night sight and green rear sight.